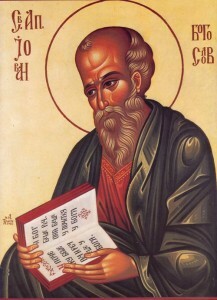 Our patron is Saint John the Theologian, whom we celebrate on the 9th of October. We celebrate this day as the School Day. The youngest of twelve apostles, Saint John faithfully followed Jesus Christ, and witnessed all of his worldly wonders. The Lord held him in high regard among the twelve apostles, and loved him dearly for his sincere love. It was he who sat by the Lord at the Last Supper, and who stood by his side when He was crucified. Following His ascension, he looked after His mother, Virgin Mary. He later travelled to Ephesus and, through his inspired preaching, he converted many into Christianity. Due to his testimony of Jesus Christ, he was exiled to the island of Patmos by the Roman emperor Domitian. It was on this island that he authored the famous Gospel and Book of Revelation. He was released during the reign of emperor Nerva. He returned to Ephesus where he continued spreading the word of God among the pagans. He died at the age of 104, raised through age with sage. Saint John is the epitome of a faithful disciple and follower. His symbol is an eagle, also represented in our school logo.